MPSC is proud to announce that we will be exhibiting at the Arab Health 2019 conference in Dubai, UAE. Arab Health is the largest medical conference in the Middle East. MPSC will be displaying their HeRO solution as a part of the Virginia Economic Development Partnership (VEDP) stand. "We have been very fortunate to have the support of the VEDP in our efforts to expand our international presence," said Geoffrey R Alms, PhD, Executive Vice President of MPSC. HeRO has recently been adopted by Sidra Hospital in Doha, Qatar, and King Hamad Hospital in Al Sayh, Bahrain. "We look forward to working with our partners and leading hospitals in the region," said Will King, CEO. May 18th, 2018, Charlottesville, Virginia – HeRO solo and HeRO duet now offer data export. In an update to the HeRO solo/duet platform, MPSC is proud to announce the availability of data export from the system. "This is in direct response to the voice of our customers," says Dr. Geoffrey Alms, Executive Vice President of Sales and Marketing at MPSC, "All feedback from our customers is evaluated in trying to improve upon our product portfolio." The new option, called "USB Data Export," will be offered as an optional upgrade available immediately on new production units of HeRO solo and HeRO duet. With the option, customers can export the data from the HeRO monitor onto a user supplied USB stick as a text file. This solution was developed in order to allow clinicians, who are interested in doing research incorporating HeRO, a mechanism for collecting the digital data generated by HeRO. Please contact your local representative about the availability of all the HeRO Products. MPSC is proud to have played a part in the care of the Waldrop sextuplets in Huntsville, Alabama. "When we heard that Huntsville Hospital was about to have sextuplets join them, we knew we had to help," says Geoff Alms, Executive Vice President. "Within a week of learning about the pending arrival, we were able to deliver 6 new HeRO Solos ready for use." The family has a Facebook page dedicated to their nine beautiful children and TLC will be hosting a documentary airing Fall 2018. Charlottesville, VA. As MPSC continues to improve the HeRO product portfolio, we are proud to announce that MPSC has received a substantially equivalent notification regarding its most recent 510k submission, the summary of which is available at https://www.accessdata.fda.gov/cdrh_docs/pdf18/K180242.pdf. November 29, 2017 - MPSC wants to thank the Virginia Economic Development Partnership (@YesVirginia_org) for the opportunity to exhibit as a proud Virginia based company. "Medica is a key congress to explore business opportunities throughout the world," said Geoffrey Alms, Executive Vice President. "We enjoyed meeting with our current and future partners to bring HeRO to more NICU patients. Medica has been an important part of the expansion of HeRO into many new markets." At the recently concluded Pediatric Academics Society Annual Conference in San Francisco, there were multiple abstracts presented about the HeRO System. Please take a look at these new studies: Sepsis screening in very low birth weight infants using heart rate characteristics monitor. Schibler K, Moreira D. PAS Conference Abstract (2017). Reduced NICU Length of Stay Using Heart Rate Characteristics Monitoring. Swanson, JR, King W, Carlo W, Sinkin RA, Schelonka R, Porcelli PJ, Navarrete C, Bancalari E, Aschner JL, Perez J, Palmer C, O'Shea M, Walker W. PAS Conference Abstract (2017). Cost Analysis of Heart Rate Characteristics Monitoring in the NICU. Karvonen KL, Vergales J, Sinkin RA, Swanson JR. PAS Conference Abstract (2017). Cook Children’s using HeRO for early detection. MPSC is proud to continue building upon the HeRO presence in the international markets. HeRO will be shown at booth Z6.F46 as a part of the US International Pavilion at the Arab Health 2017 conference in Dubai. We look forward to meeting with our established distributors and distributors for additional markets to discuss strategy and to explore beneficial opportunities with our partners. Please come and visit us in Za'abeel Hall 6, stand Z6.F46 while attending the conference. We anticipate a great opportunity to meet with our dealers and prospective dealers at the upcoming MEDICA 2016 conference in Dusseldorf, Germany. This conference is the one place and time when we can meet with dealers for much of the world all at one place. This year, MPSC will be a part of the USA CEO pavilion in Hall 16, Booth 16C04. We look forward to productive discussions towards expanding the usage of HeRO into new markets, both in Europe and beyond. MPSC looks forward to attending the Miami Neonatology conference put on by the University of Miami. This is a great event to meet with customers in the area, and there is usually a high attendance by clinicians from South America. We enjoy the high caliber faculty who present at this wonderful conference and expect to have plenty of time to interact with our users. In honor of September 13 being World Sepsis Day, we want to share some important information about this life threatening condition which affects all too many people. Improving the treatment of sepsis has two facets. First, prevention is key. Frequent handwashing has been proven to reduce the rate of sepsis in the healthcare environment. Second, early identification has a significant impact upon survival and decreases long term morbidities associated with surviving sepsis. The World Sepsis Foundation has lots of very useful information about how you can make a difference. Especially on World Sepsis Day, please take a look at their website and consider a donation. The CDC has recently started their Vital Signs campaign, #vitalsigns, to remind us of the practices that healthcare workers can implement to reduce the impact of this life threatening complication. They have prepared a useful booklet that summarizes what you should do. In the August 2016 issue of Neonatology today, the University of California San Diego talks about the addition of HeRO to their unit. Read for More. Increase your knowledge about this life threatening condition. World Sepsis Day is September 13, 2016. For more information, read up at World-Sepsis-Day.org. From their website, "The best centres, mainly in industrialized countries, have doubled patients’ chances of survival, simply by recognising the condition and responding rapidly." HeRO thanks the NICU Leadership for a great experience. MPSC is proud to have exhibited at the recently concluded NICU Leadership conference in Jacksonville, FL. The conversations with customers and potential customers demonstrates that the HeRO product continues to gain interest and attract new opportunities. Building upon our great experiences at the NEO conferences in the past, MPSC will be returning to the NEO 2016 conference to be held at the Hilton Orlando Bonnet Creek. We look forward to meeting with our current and future HeRO users at this highly regarded conference. MPSC is proud to showcase HeRO at the recent Arab Health 2016 conference. With our growing presence in the region, attending the premier conference was an appropriate venue to increase the awareness of HeRO. We look forward to continuing or growing our relationships in the region. Methodist Women's Hospital of Omaha, NE, has garnered the attention of the media with their adoption of the HeRO System. Click to see the television news report. Methodist Women's Hospital of Omaha, Nebraska, has chosen to deploy the HeRO System as a part of their update and expansion to the NICU. Read a news article about the expansion here. MPSC is pleased to announce that Wishaw General Hospital in Scotland has outfitted their entire NICU with the HeRO Monitoring System. Purchased through a donation by Garreth Wood and his wife, former Miss Scotland Nicola Wood, the hospital is the first in Scotland to fully outfit the NICU with HeRO. The BBC has produced a report on the project at: Donation of HeRO on the BBC "MPSC's HeRO System continues to gain new customers across the world," says Will King, CEO of MPSC, "We are delighted that neonatologists choose to place their confidence in our products, adopting them at an increasing rate." About HeRO HeRO® is a pioneering monitoring system for premature infants that detects early signs of distress, commonly caused by infection and other potentially life-threatening illnesses. HeRO generates an hourly numeric score that quantifies the prevalence of abnormal patterns in each patient's heart rate and provides a new tool for clinical assessment so that standard diagnostic and therapeutic decisions are better founded. In a long-running randomized study of over 3,000 preterm infants, those whose care included the HeRO monitor, experienced greater than 20 percent reduced mortality, effectively saving one infant’s life for every 48 who were monitored. About MPSC MPSC is an entrepreneurial medical device company that translates ICU research discoveries to the patient’s bedside. The company develops predictive technology that detects imminent, catastrophic illness. MPSC’s HeRO monitor is the first of a line of products to monitor in-hospital patients. MPSC is pleased to return to the March of Dimes 2015 Conference for Health Professionals to be held at the Hotel Irvine on March 16th and 17th, 2015. This conference focuses on the improvement of neonatal outcomes. MPSC's HeRO products have been shown to decrease mortality by over 20% in a randomized, controlled trial. MPSC is proud to sponsor the Neonatal Ventilation Workshop presented in association with The Kingdom of Bahrain Ministry of Health and Arabian Gulf University. This workshop will be held February 5th-8th, 2015 at the Arabian Gulf University. MPSC is proud to be an exhibitor at the upcoming 3rd Regional DC/MD/VA Neonatal-Perinatal Symposium to be held October 30, 2014 at the Bethesda North Marriott Hotel and Conference Center. We will be demonstrating the new, standalone HeRO duet monitor. MPSC is proud to join our local representatives, Infamed, at the Advances in Neonatal-Perinatal Medicine CME course in Philadelphia, Pennsylvania. This educational meeting is being hosted by the highly regarded Children's Hospital of Philadelphia. 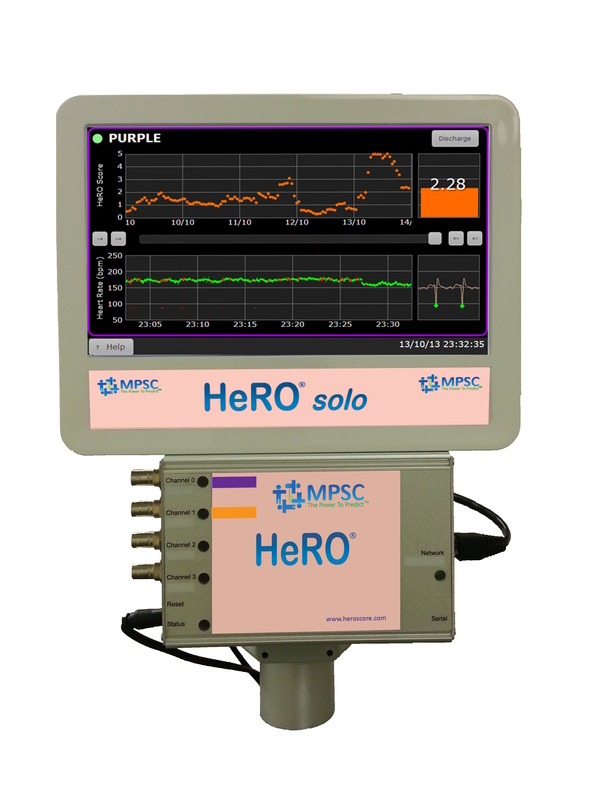 MPSC will be demonstrating the standalone HeRO duet monitor. Please come and speak with us. MPSC was proud to exhibit the HeRO duet monitor at the Florida Association of Neonatal Nurse Practitioner's Conference held at the Sheraton Sand Key Resort October 14-18 in Clearwater Beach, Florida. We were delighted to join our local representatives, Bimeco Group, to demonstrate the HeRO System at this educational conference. Dr. Karen Fairchild* from the University of Virginia will be presenting "Heart Rate and Cardiorespiratory Analysis for Early Detection of NEC" at the 2nd International Conference on NEC: SIGNEC UK held on Sept 3rd & 4th, 2014 in London. *Dr. Fairchild is not a paid representative of MPSC nor has any other conflict of interest with HeRO or MPSC, the producer of HeRO. HeRO will be exhibited at the upcoming NANN conference in Phoenix, Arizona. Please stop by at booth #338. 17 March 2014 - ITV news speaks with Dr. Banerjee about HeRO from Singleton Hospital in Wales. http://www.itv.com/news/wales/story/2014-03-17/new-technology-could-save-premature-babies-lives/. MPSC is pleased to welcome Singleton Hospital in Wales to the growing family of HeRO users. We are very proud to work with our partner, SLE Ltd, which represents MPSC in the United Kingdom. SLE helped the customer to successfully receive an innovation grant to deploy the HeRO System in their NICU. Three more HeRO publications in the press. A trio of new publications regarding HeRO hits the press. HeRO Publications lists the HeRO bibliography. The body of evidence for HeRO continues to grow. Further evidence of the effectiveness of HeRO is published in the Journal of Clinical Monitoring: Complex signals bioinformatics: evaluation of heart rate characteristics monitoring as a novel risk marker for neonatal sepsis. HeRO duet begins volume shipments. Pallets of HeRO duets awaiting international pickup. HeRO is now Multi-lingual! In response to the increasing demand for HeRO outside of the US, HeRO is now available supporting French, Italian, Russian, and Turkish. Look for more languages to be supported soon!